BURLINGTON. 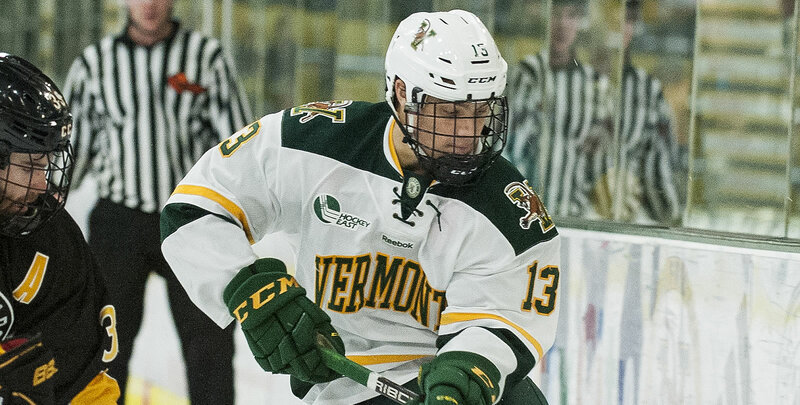 Vt. - Despite a 44-22 advantage in the shot column, the Vermont Catamounts dropped a 4-1 exhibition to the Laurentian Voyageurs Thursday night on Target Night, presented by Target, at Gutterson Fieldhouse. "We like the (line) chemistry, I thought each line did something pretty well at different times of the game, I just don't think anybody on the roster had a 60-minute game tonight," head coach Kevin Sneddon said. "It's a collective loss from the head coach down, and we have to be better on Saturday." - Laurentian tallied the game's first goal and took a 1-0 lead into the first intermission. William Gignac picked up a loose puck in the slot and cut to his backhand and slotted the puck over Tyler Harmon's (18 saves) right pad for the goal. - A Catamount turnover in the defensive end gave Laurentian a 2-0 lead 5:58 into the middle frame as Nicolas Dionne scored unassisted. - After the Voyageurs killed the sixth UVM power play of the game, Richard Therrien made it 3-0 Voyageurs with 6:05 remaining in the second period. Laurentian took that lead into the final intermission despite a 31-12 Catamount shot advantage. - Martin Frechette carried the puck towards the slot and fired the puck at teammate Bryce Misley and Laurentian goalie Mackenzie Savard (43 saves). Misley got his stick on Frechette's shot and the puck deflected past Savard into the back of the net. - The Cats pulled Harmon with 3:21 to play following Laurentian's seventh penalty of the night. Vermont was unable to find the back of the net on the 6-on-4 advantage. - Therrien netted an empty-netter to make it 4-1 Laurentian with 50 seconds remaining, and the score remained the same until the final buzzer. Vermont kicks off the home regular season schedule on Saturday (Oct. 13) as Quinnipiac visits the Gut for the first time since the 2007-08 season. Tickets are still available and can be purchased here. The first 400 students in attendance will receive a long sleeve 'The Den' shirt, courtesy of Redstone Lofts.